Dennis Emmanuel Brown (February 1, 1957 – July 1, 1999) was a Jamaican reggae singer. 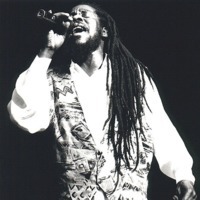 During his prolific career, which began in the late 1960s when he was aged eleven, he recorded more than 75 albums and was one of the major stars of lovers rock, a sub-genre of reggae. Bob Marley cited Brown as his favourite singer, dubbing him "The Crown Prince of Reggae", and Brown would prove hugely influential on future generations of reggae singers.